← Still in Need of Comfort Food? Roast a Chicken. To sample the new preparations, we decided to share three new “snacks” – Tria’s small plates. The first was the Warm Tuscan White Bean Spread with Paprika Toast. The melt-in-your-mouth spread, served in a crock to keep warm, was accompanied by toasted slices of baguette dusted with paprika to provide some added color and mild spice. This was so good that I will attempt to replicate it at home. 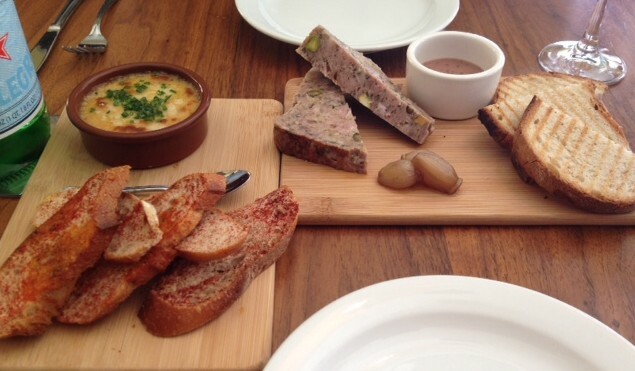 We then savored the Country Pâté with Pickled Onions and Red Wine Mustard. The generous portion had an excellent taste and texture with just the right amount of pistachios. What a treat! We paired these courses with the sparkling Blanquette de Limoux from the Languedoc, France, accurately described as having a creamy palate and toasty fruit. 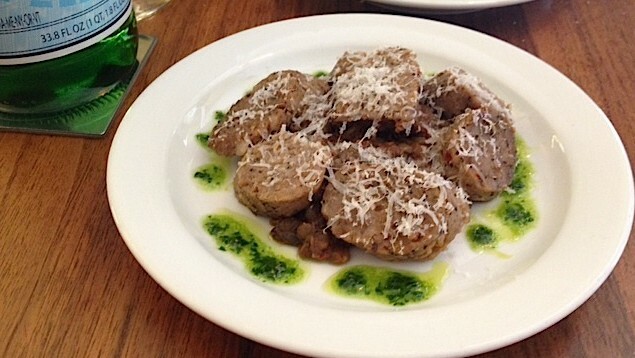 The next dish was the Housemade Fennel Sausage with Sicilian Lentils and Parmigiano-Reggiano. The thick slices of sausage displayed ample fennel seeds and flecks of red pepper. The warm, earthy lentils were balanced with a basil pesto decorating the edges of the plate. With this course we paired the Grenache Blend whose smoky cardamom flavor complemented the spices of the sausage. Although we intended to sample some of the ever-changing extensive cheese selection, we simply did not have room…next time! This entry was posted in Uncategorized and tagged Bean, Fennel, Food, Lentils, Onion, Paprika, Pate, Philadelphia, Philly, Restaurant, Sausage, Tria. Bookmark the permalink. ALWAYS save room for cheese!